IIEP organizes public events, symposia, and seminar series that explore academic and policy debates about globalization. These events help bring together researchers and policy-makers to see how cutting edge research can help inform economic policy making. 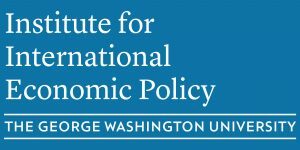 IIEP brings leading scholars and practitioners of international economic policy to GW to present and discuss their research and insights. Research conferences, where groups of scholars and policymakers delve deeply into the most important issues of the day. Policy forums, where critical contemporary policy questions and issues are explored and debated. Academic seminars, where individual researchers present cutting-edge scholarly work. Our events are open to the public. Please sign up for our mailing list if you are interested in receiving regular notification of upcoming events.